The Congressional Budget Office (CBO) released its estimate of the President's 2019 budget today. The estimates show debt would continue to rise under the President's budget, though at a slower rate than under current law. 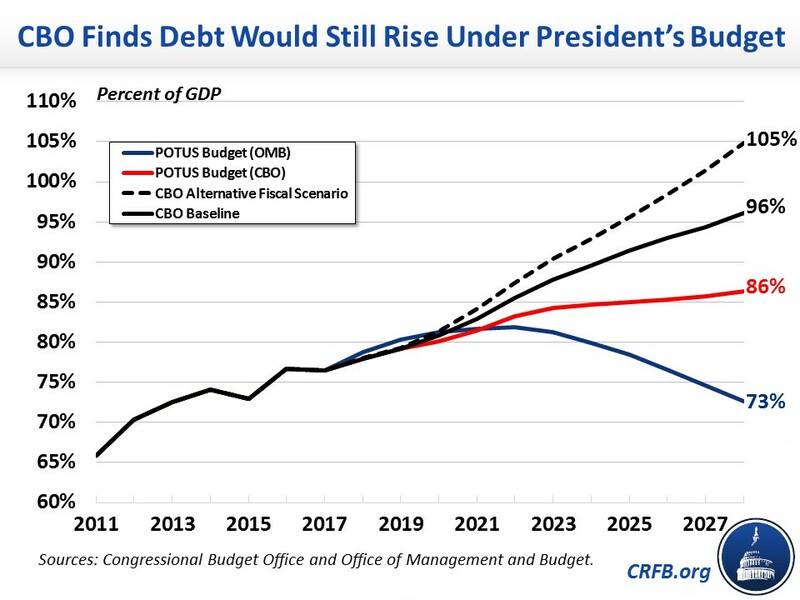 Based on CBO's projections, debt under the President's budget would rise from 77 percent of GDP today to 86 percent by 2028. That's lower than the 96 percent of GDP projected under current law or the 105 percent of GDP under the Alternative Fiscal Scenario. But unsurprisingly, it is significantly higher than estimates from the President's Office of Management and Budget's (OMB), which show debt falling to 73 percent of GDP. The biggest difference between CBO and OMB comes from each estimate's economic assumptions – which is clear from comparing their revenue numbers. OMB projects real GDP growth averaging 3 percent over the next decade while CBO's projects an average of 1.8 percent. Largely as a result, CBO estimates $1.95 trillion less in revenue than OMB – which constitutes 85 percent of the total difference over 2019 to 2028. The remaining $350 billion difference can be more than explained by CBO’s higher interest and discretionary spending estimates, partially offset by lower mandatory spending projections. Overall, deficits through 2028 under the President's budget would be $2.3 trillion higher than OMB's estimates, but $2.9 trillion lower than current law. On an annual basis, deficits will rise from $792 billion (3.9 percent of GDP) in 2018 to over $1 trillion in 2022 (4.4 percent of GDP), dip slightly, and rise again to almost $1.1 trillion in 2028 (4.2 percent of GDP). By comparison, deficits would rise to $1.5 trillion (5.1 percent of GDP) by 2028 under current law and $2.1 trillion (7.1 percent of GDP) under the Alternative Fiscal Scenario. OMB's estimates found deficits would have declined to $445 billion (1.4 percent of GDP) by 2028. CBO's analysis of the President's budget shows the budget would fall well short of the Administration's ambitious fiscal goals, though it would be an improvement over current law. Still, when stripped of its unrealistically optimistic economic assumptions, the budget would not do enough to put debt on a sustainable path. We will have a full analysis of CBO's report later today.